“¡Hola clase! ¿Qué tal?” Señor Souder greets his Spanish One and eighth grade Spanish classes every period. After greeting his students, Micah Souder talks in Spanish for ten to twenty minutes. “I talk in Spanish and make my students uncomfortable. They learn by being uncomfortable with the subject,” he said. 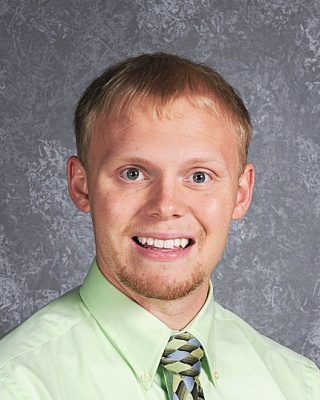 Souder, a 2006 Eastern graduate, attended college at Ball State University and did his student teaching at Anderson High School, northeast of Indianapolis. Souder moved back to Salem to be with his family. “Ninety percent of my family lives in Washington County. My brother is getting a job in town, also. We’re pretty tight,” Souder said. A requirement at Ball State for anyone majoring in a foreign language is attending a study abroad program. Souder went back to Spain and stayed in Segovia. Souder was very involved throughout his high school career. He was a member of the tennis team, track, cross country and managed the basketball team for three years. He was in Student Council, National Honor Society, Spanish Club, Spell Bowl and Academic Bowl. “Every time the yearbook would come out, the first thing I would do is go through and count the pictures of me. There were usually eight to eleven pictures.” Souder said he won three Mental Attitude Awards, several Most Improved Player Awards, and was on the All A Honor Roll every grading period except for two and got perfect attendance almost every year. Souder is passionate about his faith. “I have a rather strong faith and I try to be a good example.” Souder said that very few things can make him angry, but stereotypes, racism, disrespect for authority and apathy manage to do so. “I’ve experienced a lot more in life than most. I try to live without regrets,” Souder said. This entry was posted on Thursday, October 21st, 2010 at 7:59 pm	and posted in Archive, School News. You can follow any responses to this entry through the RSS 2.0 feed.